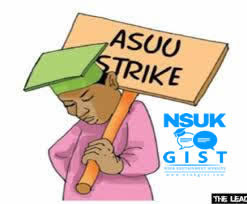 The chairman of the Academic Staff Union of Universities (ASUU), Nasarawa State University chapter, Dr. Theophilus Daniel Lagi has reiterated that ASUU was not going to settle for anything less than its demands, just as the union ordered its members not to retreat or surrender in the ongoing struggle to improve the academic standard of the institution. The ASUU chairman who was speaking with newsmen shortly after the union’s emergency congress in Keffi on Tuesday, said, the letter addressed to the union by the university Council on the contentious issues was vague and lacks specifics. Dr. Lagi opined that, the letter was a unilateral decision of the Council that lacks substance which the union can hold on to. NSUK CampusWatch gathered that the union’s emergency meeting was a fallout from the recent meeting the university Council had with the state Governor and Visitor to the university, Umaru Tanko Almakura, and a letter from the university governing council to ASUU which primarily centered on funding, EAA and monthly tax deduction from their salaries etc. In the letter, the governing council of the university is offering the union 15% of the total demand of 45%, but on the condition that the strike be suspended, after which if the financial status of the state improves, their entire requests would be met. The ASUU chairman however observed that government failed to be specific on its offer to the union, as the issues therein were very technical, adding that what the government was offering was vague promises. government, there is nothing like that and so it is vague. He added, “for instance, if you are reviewing a white paper, how do you go about it, who are the culprits, how is it implemented? You know these things are technical and technicalities are what they are supposed to be reveal to us. Even the promotion guideline we need to have a draft to look into if we are satisfied by them, not just vague promises. “That letter written to us suppose to contain substance. And it is unilaterally coming just from them, we have not sat down to negotiate on these items with them, nothing was signed and so, as far as we are concern, there is no way, there is no how we have come this far and we will accept these things the way it is,” he said. The ASUU chairman then said compromising their stand for crumbs would spell doom for the university, and urged the state government to be serious in their commitment in funding the university. He noted that the council meeting with the state government only worsened the situation, as the governing council was not sincere in its determination to address the issues at hand. Dr. Lagi said the union would not succumb to pressure from any quarter, adding that what they are fighting for was in the interest of the university and the state as a whole. He urged students to show understanding and not to be swayed by propaganda coming from several quarters against ASUU, saying the union is determined more than ever to fight for the interest of the students by ensuring that government repositioned the university in order to produce qualified and world class graduates.